Syfy/Asylum Jumps The Shark with SHARKNADO 3! Yes gang, you heard right. Well, you read right, unless you're using text to speech software. But sure enough, as if one Sharknado wasn't enough, what with its quirky success on Syfy and a weak attempt at a latter theatrical release. They had to go and make a sequel. I mean, hey, why leave well enough alone when you can make it worse with a sequel. 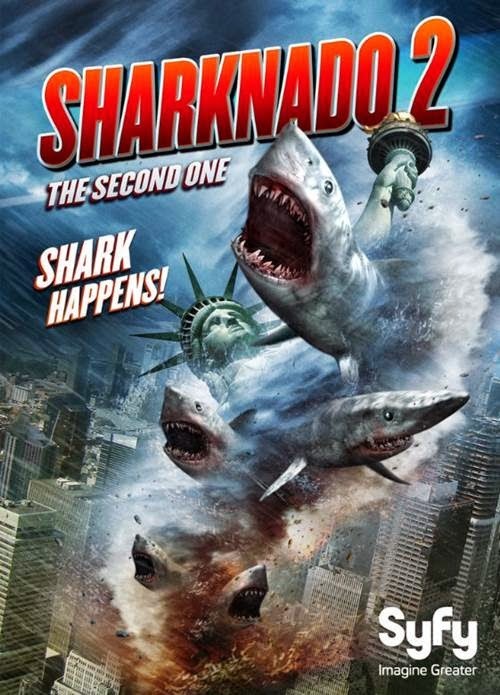 But wait, before we even get tortured by a sequel from Asylum, we now have word that there will be a third Sharknado. A THIRD tornado full of sharks! What are the odds? Apparently bad enough to have another one coming our way. You know, I just had an idea. Since Asylum's big reputation is known for ripping off mainstream movies, ie: Atlantic Rim, AE: Apocalypse Earth, Jack the Giant Killer, Abraham Lincoln vs. Zombies, Battle of Los Angeles, Titanic II, Paranormal Entity... some mainstream distributor should get something up and running that mocks Sharknado and turn the tides on them! LOL. But all joking aside, Syfy and Asylum announced Sharknado 3 today. It's really more of an announcement of when Sharknado 2 will air on Syfy, but hey, you've been warned.